In the Making | Crockett & Jones. | A Continuous Lean. In the Making | Crockett & Jones. The history, the shape of the lasts, the legacy and most of all the quality. Those are the reasons which keep me buying and wearing shoes from Crockett & Jones. Every time I am in London I stop by at least one of the Northampton shoemaker’s shops (there are two storefronts on Jermyn Street for some odd reason) in Mayfair to browse and to occasionally take home a new pair of shoes that I plan on owning forever. The New York store is also nice to visit, but not nearly as much fun as seeing these shoes on their home soil. Crockett & Jones is one of those companies that I have long sought to know on a more intimate basis, partially because I admire the history of the company, but also because I like to wear the shoes so much. Only thing is, Crockett & Jones is a pretty conservative company, one that is much more focused on making great shoes than making much of a fuss on the internet. It rightfully figured it has a loyal following and a strong business, the product is the marketing. All of this reminds me of Alden. (Incidentally I have basically never had any contact with Alden, but that’s fine because all I need from them is to continue making shoes I love.) The beloved New England shoemaker is another company that doesn’t need to have a heavy hand when it comes to marketing, the shoes and the quality tell everyone all they need to know. Production is limited and it doesn’t want to go crazy increasing it and risk ruining everything. It’s admirable because it works, and also because both Alden and Crockett make such great things. Eventually I have come to know some of the people at Crockett & Jones and they in turn got to know me (and ACL) a bit better. 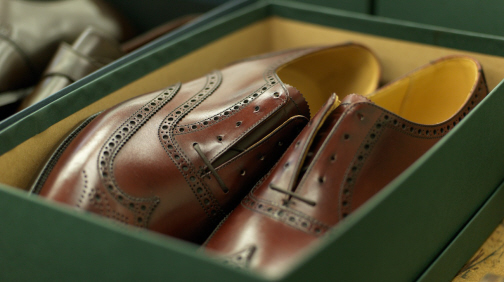 Not long ago the iconic English shoemaker produced a film that speaks to the history and process of making its fine leather shoes. It was something that I thought would find a good home on ACL and after some discussion Crockett & Jones agreed and for the first time allowed the video to be shared on an outside site. Being the shy company that it is Crockett & Jones doesn’t need the attention, but for people like us who appreciate the process and the history, these stories are an immeasurably positive force. Sort of like meeting your hero and walking away with the confirmation that they actually are everything you imagined. 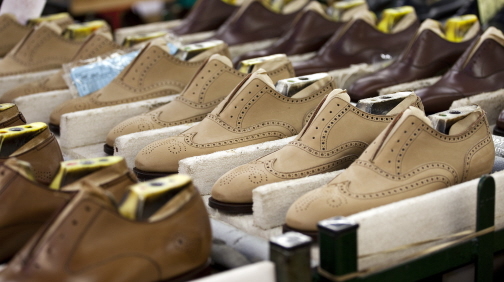 I am loyal follower of C&J and have been for quite a while – great shoes, fair price point, and admirable heritage. This smells a bit like a sponsored post though… not that it matters if it indeed is – but I think people have come to appreciate the ACL full disclosure notes. How comparable is Alden to C&J? Crockett & Jones doesn’t like making a fuss on the internet? What, like by sponsoring the biggest blockbuster of the Fall, 007 Skyfall? I don’t think they sponsored it as much as they made shoes for it. But you do have a point. The whole Skyfall thing has reached epic levels of promotions from every brand in Britain. It is crazy. As an american (‘nor easterner) who has been here 10yrs I fully back you up on the C&J quality and the Alden reference. Its a solid comparable, with the caveat that Crockets tend to do slightly more interesting lasts and materials without being insanely expensive. The lasts (and the pricing) aren’t as aggressive as Weston or Lobb but still a bit more Euro than Alden. Which works well with the resurgence in Italian style tailoring that’s showing up now. More importantly – defo give a shout out next time youre headed over. am sure you have plenty of us here who’d happily meet up for a few rounds. and they’re a few joints over here that do pretty decent sliders to sop it all up afterwards as well. I have always been a visual fan of C&J, but now Im sold. I have to find myself a pair. Quality is so hard to find today. Thank god its coming back! Great post. I love C&J. I have two pairs and plan on Them lasting forever. They have an “aggressive” price-point, but if they last half as long as I hope they are a better deal than anything out there. Also Their styling is not so intense that they will go out of fashion before they wear out. What we Brits do is visit Northampton and pick up the best bargains in the “seconds” shoe shops, you would have to be a shoemaker to pick up the faults. Another great post Michael and I do like to see non-US brands getting your thumbs up now and again. But why did you have to jump on the Skyfall promo bandwagon? Sony and Heineken are not British and product placement in the Bond films is nothing new – think Martini in his favourite tipple from all the 60s Bond films. Great shoes. Tricksters are also a quality brand. Great post, and great shoes. Anyone who is headed to London might also check out Justin Deakin’s shop in Spitalfields. We stumbled on it last winter. Justin himself was minding shop that day, and we bought some great shoes. Seems Deakin is somewhat of a celeb in the shoe world, and heck of a nice guy. Regarding the Skyfall promotion, word on the street (or the forums) is that Daniel Craig specifically requested Crockett & Jones, rather than C&J reaching out to the producers. That said, they have not shied away from the publicity. Absolutely classic shoes though. There really is no comparison between C&J and Alden. I’ve had quite a few pairs of Alden, and they all look hastily put together in comparison to C&J. Two of my Aldens had stitching come loose. I’d say C&Js are a couple of notches above Aldens, easily. It’s very evident when you are holding both in your hands.